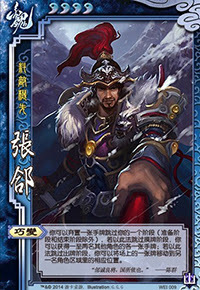 At the beginning of any of his phases (judgement, drawing, action, discard), Zhang He can discard a hand card to skip the phase. If Zhang He skips his drawing phase with this ability, he can select up to two characters and draw one hand card from each. If Zhang He skips his action phase in this manner, he can select one piece of equipment or pending delay tool card on one character and place it in an identical location on another character. If he moves equipment in this manner, he cannot use it to replace another similar piece of equipment on another character. Note that to activate "Clever Change," Zhang He must discard a hand card for each phase. He cannot discard equipment cards. If Zhang He does not have any hand cards at the beginning of a phase, he cannot skip that phase via this ability. If Zhang He does not skip his judgement phase via "Clever Change" and fails when he flips the judgement, the tool card will skip one of his phases. Zhang He cannot use "Clever Change" to skip that phase. For example, If Zhang He is the victim of Starvation, he cannot discard a card and choose two characters to draw one card from each of their hands. Remember the rule of thumb for assessing if a character can activate an ability by skipping a phase: you cannot skip what you do not have. When skipping his judgement phase via "Clever Change," a pending delay tool card on him stays in the pending tool card area until he either flips a judgement for it, uses "Clever Change" and skips his action phase to place it on another character, or another character removes it via Break or Steal. Zhang He select himself when he chooses a character to move a piece of equipment or pending delay tool card when skipping his action phase via "Clever Change." In other words, he can move equipment from other player's equipped area to Zhang He's equipped area or vise-versa. Additionally, he can move pending judgement cards from his judgement area (assuming he skipped his judgement phase via "Clever Change") to the judgement area of another character or vise-versa. If Zhang He skips his action phase via "Clever Change" and moves Lightning from the character who played it to another character, the other character must flip a judgement for Lightning immediately in their next judgement phase. In other words, they do not get to wait a round before flipping a judgement card in the same way that a character who plays this card from their hand does. When Zhang He skips his discard phase, he does not need to discard cards until he has as many hand cards as units of health remaining. 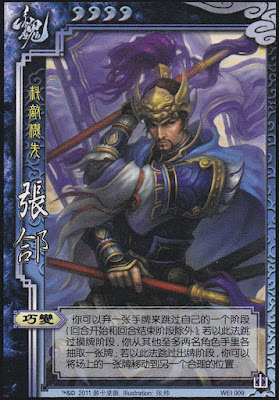 In effect, Zhang He only needs to discard one card at the end of each of his turns if he activates "Clever Change." In each of his turns, Zhang He can skip as many phases as he would like so long as he has the hand cards to discard to activate "Clever Change." Zhang He is a wonderful utility character. "Clever Change" is a very versatile ability that gives him many options of things that he can do during his turn. The advantage that Zhang He enjoys when he skips his drawing phase is the same one that Zhang Liao enjoys when he uses his "Raid," the only difference being that Zhang He must discard a hand card to activate this ability. This gives him a powerful card destruction technique. When Zhang He skips his action phase via "Clever Change," he has a power similar to that of Wu Guo Tai's "Exposure." He can use this power to simultaneously remove weaken enemies and fortify himself or his allies. Additionally, he can use this ability to move pending judgement cards from his allies to his enemies, which is also very useful. If another character targets Zhang He with a delay tool card, Zhang He can skip both his judgement phase and his action phase to remove the card from his judgement area and place it in that of an enemy. "Clever Change" is a powerful ability, but it can be quite expensive because he needs to discard a hand card for each phase that he chooses to skip. This makes him very vulnerable to card destruction techniques. Zhang He is often weak in one-on-one situations. "Clever Change" is most useful when he has multiple enemies and allies. Zhang He's turns are often entirely skipped if he chooses to use "Clever Change" multiple times during his turn to skip multiple phases. Many players skip the drawing and action phases to steal hand cards and swap around equipment. This may not be a weakness per-say if there are legitimate reasons to skip these phases, but it can sometimes make playing the game less fun. As mentioned in the 'Advantages' section, Zhang He can essentially make himself immune to delay tool cards by skipping his judgement and action phases. This is true, but Zhang He can only do this by paying a heavy price. When he does this, he must discard two hand cards (one for each phase skipped) and skip his action phase. Xun Yu/Guo Jia/Liu Bei/Lu Su - These characters can give Zhang He cards that he needs to activate "Clever Change." Sun Shang Xiang/Ling Tong - These characters have abilities that activate when equipment leaves their equipment area. Zhang He can use "Clever Change" to place equipment in their equipment area or remove it. Zhang Liao/Gan Ning/Jiang Wei/Pang De - Zhang He is a rare bird. While he shares a lot in common with these characters in that he specializes in card destruction, he is weak to card destruction himself. These characters can use their abilities to discard Zhang He's hand cards and make it more difficult to activate "Clever Change." Wu Guo Tai - Wu Guo Tai's "Exposure" works in a similar way to "Clever Change" when Zhang He uses it to skip his action phase to move equipment. These two characters may sometimes compete with each other when moving equipment around. King Zhang He is not a good king choice. As the center of attention, rebels will focus their efforts on hurting him. Zhang He will most likely have to use most of his hand cards to fend them off, leaving few or no hand cards for "Clever Change." Loyalist Zhang He is a good loyalist. He can use "Clever Change" to steal from rebels and fortify the king with equipment. Additionally, "Clever Change" can be used to move pending judgement cards from the king or loyalists to the rebels. Rebel Zhang He is a good rebel for the same reasons that he is a good loyalist. He can steal from his enemies and protect his friends with "Clever Change." Spy Zhang He is a mediocre spy pick. He is a high profile character and other characters will take notice when he steals their cards. Additionally, he works best with a team. However, Zhang He may have an advantage if he keeps a low profile while occasionally 'siphoning' equipment to his equipment area. For example, If Zhang He can acquire the Wood Armor and a +1 Horse, it becomes harder to hurt him and he does not have to worry about Barbarians and Hail of Arrows. Zhang He is a very useful team player. "Clever Change" is one of the few abilities that has multiple uses. To players who have not tried him yet, Zhang He seems like an 'improved' version of Zhang Liao that makes the original obsolete. This is clearly not the case. Zhang Liao's "Raid" is 'free' whereas "Clever Change" costs Zhang He one card for each phase skipped. While one card does not seem like a big deal, the cost of this power can add up very quickly when skipping multiple phases. To use Zhang He effectively, "Clever Change" must be balanced with Zhang He's needs.